Can A Church Live Again? Turning around an old, established church is not an easy task. Waters have to be stirred, people have to be shaken out of their comfort zones, and often there are enormous costs to bear. Change does not come easy in established churches. Many churches make the mistake of changing programs or worship styles without first changing the core values of the church. Change does not happen overnight. Anyone who would transition a church had better pack a lunch and make a commitment for the long haul. Can a Church Live Again? 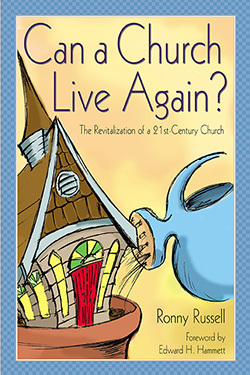 tells the story of one church’s renewal and revisioning over the past decade. A long-tenured pastor and other church leaders had a vision for a spiritual restoration of their church through its disciple-making roots. The result has been that a century-old church in rural North Carolina has become a model for church renewal. This story is told in Pastor Ronny Russell’s own words, sharing principles of how this all happened for his church...and how a similar renewal can be felt by any church. This is not a quick-fix for church stagnation or decline. Rather, it is the inspiring story of one church’s journey into hope and life. Ronny Russell, D. Min., is the senior pastor of Mission Baptist Church in Locust, N.C., where he has served for twenty-eight years. He and his wife, Judy, have two children, Jennifer and David, and three grandchildren, Trey, Jillian, and Will. The bad news is that 85% of the churches in America are not growing. In fact, they are dying! Never before in American history has the church been so anemic. The good news is that we serve a God who majors in resurrection. A church that has died or is dying can in fact live again! If you are in one of the 85% of churches that are not growing, this book is for you! Ronny Russell’s story of the turnaround of his church will encourage and enlighten you to hope again. If experience is the best teacher, Ronny Russell has learned his lessons well in nearly thirty years as pastor of Mission Baptist Church. His story of his own transformation and of his efforts to lead change in that place is both honest and remarkable. His powerful testimony reminds us that leading meaningful change in a church has its costs and that they are high. But evidence of his passion for doing church effectively emerges in each story told. As Ronny says, when confronted by another soul in need… ‘You have come to the right church.’ Mission Baptist now lives out its name each day and one person at a time. His words have served to encourage and inspire me in my own effort to lead change in an old, established church. It will do the same for all who are part of an existing congregation that is searching for authenticity in the walk of Christian discipleship. Although mine is hardly a household name, I do occasionally get manuscripts from friends and acquaintances for review. It is often a worrisome task. Like some of my own efforts, most books about local church administration and renewal are heavy on advice and light on helpful insights. It was a real pleasure to find that this book by Ronny Russell broke the mold. Every reader will enjoy it, not only for its discernment into the processes for revisioning church mission, but for its value as an entertaining look at the whole of congregational life. The book has an aura of credibility because it comes from the experience of a real person in a real community. These people and this series of stages actually happened, but more than that they are a paradigm of the larger population of the whole body of Christ in this generation and nation. We are threatened with the stagnation of a great religious tradition, not because we have failed the tradition, but because we have become a slave to it. Observing the tensions and anxieties that accompany the rebirth of a community of faith, we are reminded of our own failures to see outside the box and trust the Holy Spirit. Some fundamental values will have to change before actions and results are altered. We are reminded that the rebirth of a church is painful, like the birth of a child, but it can bring a new spiritual life and heightened awareness of the presence of God at work in the world. Meanwhile, there may be danger and chaos, even in the midst of the best administered renewal effort. But, as Ronny reminds us, it was out of chaos that the world was created. But, the book is more than just a warning of the pitfalls in bringing the church to a new identity and mission. It is also a roadmap for those who will need to walk that way. Instead of a series of steps and admonitions, the text presents a broad outline of the dynamic of a church transitioning toward renewal. From these incidents we can glean guidance for our own journey. The experience of each person and congregations is different, but the effect is the same: a new church for a new day. I am grateful to have seen this manuscript before it was published and look forward to sharing it with the people of faith everywhere. Four special qualities make Ronny Russell's reflections on church turnaround so helpful. First, he's honest. He doesn't cover up the pain and struggle of church rebirth. Second, he's experienced, which means he's realistic. Third, he synthesizes valuable insights from many other excellent writers. Finally, he's humble. This isn't the slick sales pitch of somebody with some slick ministry program to sell. This is a brother who loves the church and knows it needs radical change ... sharing his rich experience and contagious hope with the rest of us. Dr. Ronny Russell is a dedicated man of God who has challenged the hearts of his congregation at Mission Baptist Church to discover the joys of discipleship. I would recommend this book to any pastor who is seeking guidance in transitioning their church from a traditional "hold-the-fort" type of church to one of discipleship, ministry and missions. 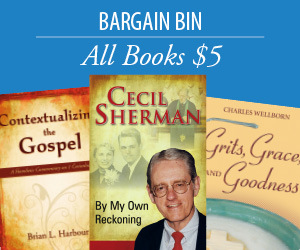 This book gives hope, encouragement, and some practical ways to help transition the church.